Now that summertime is upon us, kids are spending more time outside, families are going to more outdoor outings and many are heading out on vacation. Join Greater Houston Orthodontics and the EWG (Environmental Working Group) in their efforts, along with dermatologists and sunscreen companies to educate the public when it comes to the truth about sunscreens and sun safety. At Greater Houston Orthodontics we wish all our patients and their families a fun summer. 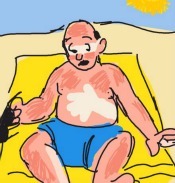 When out in the sun for extended periods of time, make sure you are protected and practice smart sun safety. For answers to more FAQ about Sun Safety, click here.